Welcome to Part 4 of "DC Direct schools Mattel," a continuing comparison of the ways in which even a company new to the world of toys can outpace the industry's old guard by making good decisions. Our comparison figure this time is Robin, the Boy Wonder. For a long time, DC Direct was contractually barred from making figures of some of their biggest licenses, so this is the first modern Robin we've gotten from them in their five years. Sure, they've made Silver Age and Super Friends versions, but who the hell cares about those? We live in the now! There's no time for cheap nostalgia! Zoom zoom bif bam pow! Forward! Training under the watchful eye of the Dark Knight prepared Robin for just about anything... and he's needed that preparation as a member of the Teen Titans! Robin comes to us not from a line of Batman figures, but from the Teen Titans. Really just the "JLA Jr.," the Teen Titans was what kid sidekicks did while the grownups were saving the world or having fondue parties or whatever it was those crazy swingers got up to. The comic has recently been relaunched, since the DC Universe was again getting overpopulated by superpowered teens with no after-school activities. Never ones to miss an opportunity, the folks over at DC Direct whipped up a line of Titans-based figures based on artist Mike McKone's designs. Not that McKone radically redesigned the characters. 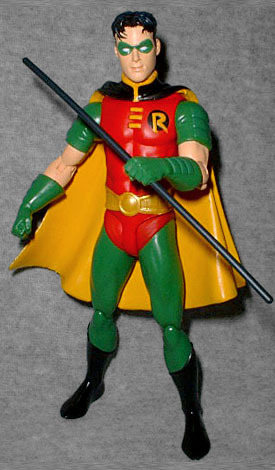 Robin, for instance, is the same design (originally created by Neal Adams for the Tim Burton movies) that we've known for years - red and green costume, black and yellow cape. No major changes, so this figure will fit perfectly with the Batman of your choosing. The sculpt is quite good, and definitely better than Mattel's little bodybuilder. Robin's muscular, but not totally ripped; he's still a kid, after all, so he shouldn't be. He's 1/16th of an inch shy of the 6" mark, which makes him appropriately small next to the adults. Overall, this looks like one of McKone's drawings, just as it should. There are a lot of nice little details in the costume, like the padded pouches on his shoulders and gloves. Unlike a lot of characters who got mid-90s costume designs with pouches all over the place, Robin's make sense as a sort of supplement to his utility belt. Additionally, a detail that would have been easy to overlook is the split-toed tabi boots Robin's wearing - he's got a different fighting style than his mentor (less brute force, more guile and misdirection), so these suit him better than Bruce's big flat soles. 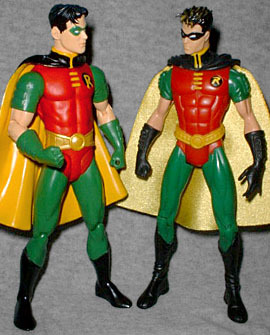 Robin moves at the neck, shoulders, elbows, gloves, hips and knees, which isn't substantially better than Mattel's version. DC could have managed joints where the arms meet the sleeves, and a waist joint would have been good, too. Robin has only one accessory, a 4⅛" bo staff. Although it's thin, the staff is made from a surprisingly sturdy plastic - no Marvel Legends-style warping here. Though the accessory is simple and undetailed, it's still better than the ridiculous disc launcher Mattel made. 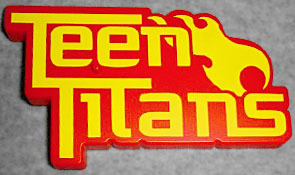 The figures in the Teen Titans line all come with a small display base designed after the contemporary Teen Titans masthead. DC Direct finally put these logo bases to good use, packaging them at the top of the blister to actually serve as the line's logo. Pretty clever. While DC Direct's Robin isn't radically different from Mattel's, little subtleties make all the difference - a better sculpt, better accessory, sculpted cape instead of cloth and nicer packaging. Though they're a small company, DC Direct has again schooled Mattel.